Radio is the science of wirelessly transmitting data to a remote point where a receiver detects the signal. In common lexicon we think of radio in the context of FM or AM stations that broadcast a radio announcer speaking and playing music, but in fact radio waves are also used for sending and receiving data such as wifi networks, satellite broadcasts and Bluetooth devices. 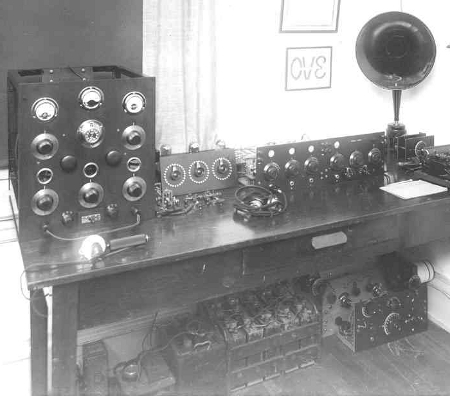 The history of radio begins in the mid 1800s with theoretical discussions that electricity and magnetism were related. The telegraph system was the first direct commercially viable technology to be developed from this discovery, although telegraph required fixed wire cables and could only be transmitted from point to point, and needed human operators to retransmit a signal over long distances. The first true wireless experiments weren’t carried out until after James Maxwell had developed his own theories and incorporated the experiments of Michael Faraday into the unified theory of electromagnetism in 1865. Over the next decade several amateurs and physicists such as William Henry Ward, Mahlon Loomis, and Thomas Edison patented methods of sending and receiving a wireless telegraph system but none of these people ever demonstrated a working system. This all changed in 1884 when Temistocle Calzecchi-Onesti invented a device which was subsequently refined and then named a coherer by Edouard Branly in 1886. The coherer became the enabling technology that allowed early radio signals to be received. The coherer is a glass tube filled with metal filings and connected to an electrical current which produced an audible click in a sounder whilst the signal was being received. By 1887 Heinrich Hertz had refined a system that allowed him to experiment with sending wireless signals to a wireless receiver and is credited with being the first person to intentionally transmit and also receive a wireless signal. Strangely Hertz had no interest in the technology and was simply experimenting with practical electromagnetic waves to advance his theories, but his research paved the way for other, and more commercially attuned inventors. In 1933 Hertz was honored when the unit of measure of radio and electrical frequencies was named in his honor as part of the new International Metric System. A Serbian-Croatian immigrant to the US Nikola Tesla in 1892 demonstrated the first complete radio transmitter and receiver system, and in so doing was the very first person to successfully invent radio. Sadly, Tesla suffered a fire in his laboratory in 1895 just as he was about to demonstrate radio over a distance of 50 miles in New York. That experiment never happened but by 1898 Tesla demonstrated the first radio controlled boat and filed a series of patents for radio in the early 1900s. 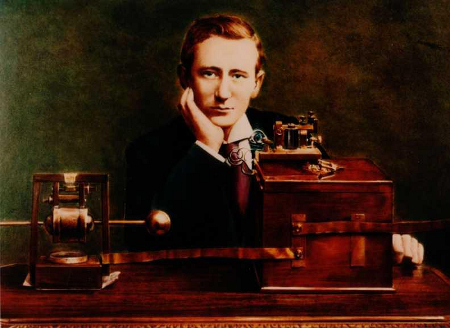 Guglielmo Marconi, a young man from Bologna in Italy had been fascinated by the idea of wirelessly transmitting a telegraph signal and in 1894 succeeded in inventing a spark transmitter with an antenna that he used to broadcast a signal across his parents garden and then across a distance of a mile in the countryside. The Italian Postal Service which controlled telegraph services weren’t interested in Marconi’s experiment so in 1896 he made his way to England and successfully demonstrated his technology to the English Post Office who immediately secured his services. The following year Marconi established the Wireless Telegraph and Signal Company and was selling his patented invention to shipping companies. So successful was Marconi’s invention that Queen Victoria herself had one installed on a ship that her son the Prince of Wales was using whilst he recovered from illness. In 1898 Marconi also established the American Marconi Co recognizing that the US was quickly becoming one of the world’s most important merchant navy operators. Whilst Marconi’s inventions were outstanding his real genius lay in commercializing his technology, an act that started with demonstrating a successful broadcast across the Atlantic in 1901, an event which progressed the development of radio broadcasting far more than any other single act. Marconi was related to British nobility who were powerful investors in his companies and in the emerging markets in the US. So powerful were his backers that Marconi managed to have a patent for the invention of radio registered even though Tesla had a pre-existing patent. A legal dispute between the two started in 1915 and wasn’t finally settled until 1943 when the US Supreme Court finally upheld Tesla’s patent number 609,154 and confirming his role as the inventor of radio. Another American Reginald Fessenden had heard of Marconi’s success but was convinced the enabling technology could be redesigned and be both more efficient, but also allow audio broadcasts, and in 1900 demonstrated his new technology which would afterwards be used by the weather department for sending time and weather information to ships at see. In 1906 or 1909, nobody knows for sure since Fessenden only wrote his notes 25 years later, the very first audio transmission was carried out by Fessenden playing a violin and reading a few passages from the Bible. Fessendon invented the Barretter detector which allowed him to also develop amplitude modulation (AM), a radio transmitting technique that allowed multiple transmitters to operate at different frequencies and effectively share the airwaves. So revolutionary was the development of radio by Fessenden and his peers that in 1910 a test transmission was held at the Metropolitan Opera House in New York where Enrico Caruso was performing. This broadcast was heard over 20 miles away by a merchant cargo ship sailing into New York from Europe and reported by the New York Times on January 14th 1910. The science of radio broadcasting continued at breakneck pace during these early years although consumer uptake remained elusive. A number of audio broadcasts had been transmitted including the ultimatum demand from President Wilson to Germany in 1918 and a highly publicized broadcast from the Naval radio station at Arlington to the Eiffel Tower in France. The end of WWI saw the US government relax control of radio patents and in 1920 KDKA, a Westinghouse owned station in Pittsburgh broadcast coverage of the Harding Cox election. Between commentary they also broadcast other short programs. Commercial broadcasting took off after this with stations opening in every major city of the US and in major capitals around Europe. The 1920s truly were the birth years of modern radio as we know it. The development of stable mass produced vacuum valves made it possible for almost every home to own a radio. 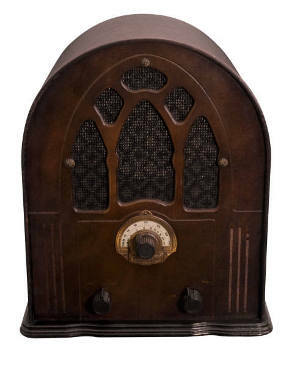 These weren’t small, each radio was fitted into a cabinet that would take pride of place in the family living room and around which the entire family would gather every evening. Edwin Armstrong, a radio pioneer with the Navy during WWI continued to develop his experiments, and being unhappy with the quality of sound from the AM system which was always known for being a bit flat and prone to white noise and static, he set about reinventing radio broadcasting which resulted in frequency modulation (FM) being made available in 1933. 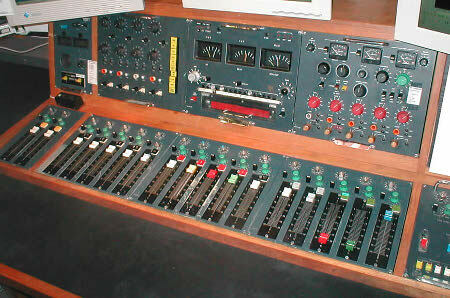 Stations broadcasting in FM were slow to develop given the expense of the new system until the invention of the transistor. Scientists from Bell Labs invented the transistor in 1947, a technology that transformed modern electronics, although with the huge investments in tubes that already existed it was several years until a commercial transistor radio hit the market. Masaru Ibuka, a young radio repair technician in Japan managed to convince Bell Labs to license the use of the transistor to him for a new radio he wanted to develop. In the US Texas Instruments and Regency were also developing heir own transistor powered radios but it wasn’t until 1957, and the release of Sony’s TR-63 AM portable battery powered radio, which at the time was the world’s smallest radio, that radio really became the dominant medium for new and entertainment. During the 1960s television started to catch up as the preferred medium of entertainment for Americans although radio firmly held on in the car, and by the late 1990s most Americans only listened to the radio in the car or at work, a position radio is set to enjoy for years to come. Despite the advent of satellite and Internet radio, wirelessly broadcasting traffic reports, news, and music to radio receivers is still dominant. Recently several female sexual enhancers have come on the market to combat low female libido. You may also appreciate the gardens. While not elaborate, they may be nicely kept.